Do you remember Scooby-Doo? I used to watch this show on Saturday mornings when I was a child. Scooby was an original. He was the Big Dog. Scooby and Shaggy portrayed some of the best animated physical comedy ever! 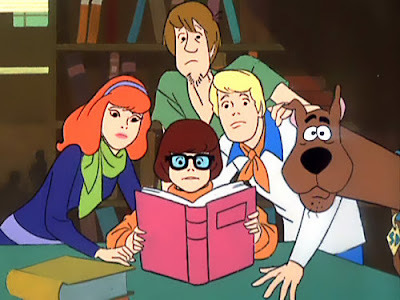 When Scrappy came along the ghosts and monsters were no longer villains wearing masks, who were later discovered to be criminals. The supernatural villains that Scrappy fought were real! Spiritualizing these facts, you could interpret that Scooby was a righteous dog, while Scrappy was of the devil! I know, that's a little extreme. Mainly, he was obnoxious. Scrappy-Doo was one little dog that the Mystery Machine should have run over! Taking the analogy infinitely higher, we find that people occasionally have traded their Big-God for a little-god. After the Exodus, I always thought that when the Israelites bowed down to the golden calf they were worshiping the calf as their God. But according to Exodus 32 they were worshiping God as the calf. The scripture says we're going to hold a festival to the LORD (YHWH - The vowel-less Hebrew name for God, sometimes pronounced, "Yahweh"). Then they said, “These are your gods, O Israel, who brought you up out of Egypt.” They didn't say, "let's worship this instead of YHWH." It's as though they were saying, "This little idol that we can manipulate, let's just call this YHWH." The sin of idolatry isn’t limited to calling a statue your god and bowing down to it. It can also be any attempt to shrink the real, true and living God down to a size we can handle; a god we can predict, manage and even control; a god we conceive in our own mind. I call this god, “little god.” Taking our small view of god and calling it "God," is as idolatrous as worshiping a lump of coal. The commandment says, "You shall not make for yourself a carved image, or any likeness of anything that is in heaven above, or that is in the earth beneath, or that is in the water under the earth." -Exodus 20:4 (ESV) This forbids us from making any kind of image of God out of physical materials. What about making a god out of our own small ideas about God? This commandment is also against us trying to characterize God by any kind of concept in our mind that is less than what God actually is. Study the true characteristics of God, to keep from substituting Him with "little-god" attributes. These three Big-God attributes should be enough to study for now. Remember, if you're serving someone who doesn't meet these three characteristics, you're serving a false god! Taste and see that the (Real, and Big) Lord is good! Big God is why I am living here on earth today. I kind of skipped over the little God-as for I just didn't know God until late in life-so I was just a darn sinner-with no regret, no fear, not much guilt at all. But with Christ in my life today-saving me from so much-I KNOW WHO THE BIG GOD IS...and it is worth everything to give up in the secular world-to be "cool" and be cool with God instead. He comforts when down or sick, He heals, He guides, He loves, He forgives, He has mercy, He is non stop in love with us-we just have to show it back and it blooms amazingly. Even during hard times. I was just in the hospital, again-and He had me feeling so positive-even during it all, seizures and all-that not many understood. God works wonders thru His hands of grace-just have to let Him in.